Incredible views! Fish right off the deck that hangs out over the water! NEW HOT TUB! This lakefront property is 5 acres with over 400 feet of lakefront. Main house is fully furnished with 2 bedrooms / 2.5 baths on the water’s edge, with a spacious 1900 sq. ft. deck overhanging the lake. New outdoor furniture, with jacuzzi, fire pit and BBQ grill, and seating for 15 people outside. This wonderful property sleeps 10, 6 in the main house (4 in beds and 2 in a sleeper sofa), plus it sleeps 4 in the separate 2-bedroom guest house (the guest house is an additional $100.00 per night if you have more than 6 guests). 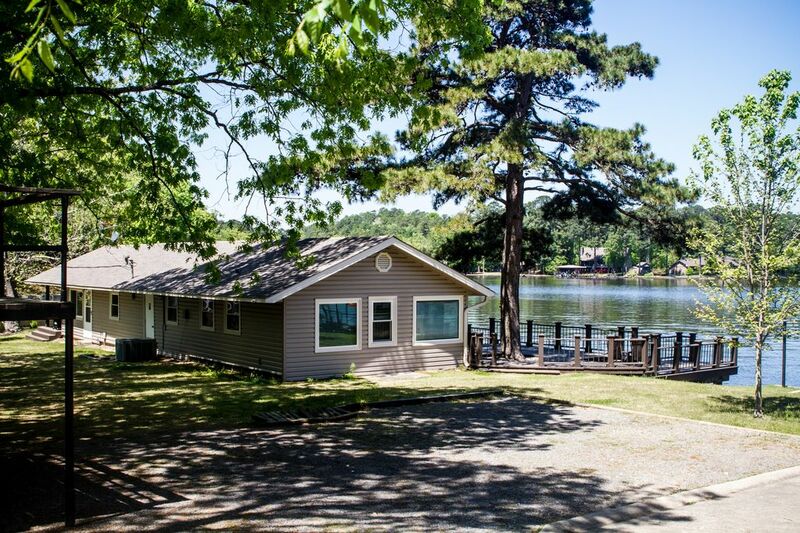 This property has a private boat ramp, private boat dock and lots of parking for a boat trailer. Also included is a separate 1200 sf. game room (man cave) with new pool table, full length shuffleboard, WIFI and big screen TV with lots of seating. Check out our website strackshack dotcom for more pics and info. • Large 1900 sq. ft. deck overhanging lake with jacuzzi, BBQ grill and fire pit! • 1200' Game room! Pool table, shuffle board, big screen TV & WIFI! 1200 sq. ft. game room with new pool table, full length shuffleboard, beer/soda fridge, WIFI and big screen TV with lots of seating. Had a wonderful time because the house and game room are terrific! We loved this home. We love to fish, so seeing my son be able to fish with his great aunt was such a blessing <3 Had everything we needed, the game room was lots of fun for the whole family. We really enjoyed our stay everything we could have asked for and more. We would certainly recommend this place to all our friends and will be booking again. We had our fishing club’s 10 year celebration at the Strack Shack this year and had a wonderful time. The deck, hot tub, and outdoor fire got plenty of use, as it was quite chilly. Unfortunately, there were a few maintenance issues during our stay, but the management company quickly responded and resolved each issue. We loved the big table for our meals! The beds were extremely comfortable and had nice linens, and there was plenty of hot water! All in all, a delightful long weekend. Was a good place for a weekend in Hot Springs. Very clean and well maintained. Great views on the deck and the game room was a plus. Would definitely recommend. Wonderful place with fantastic views!! We really enjoyed our stay here. Incredible lake views from inside the house in the kitchen, dining area, and TV room, as well as the awesome deck with fire pit! The furniture on the deck was very nice and comfortable for relaxing and enjoying the lake and great views. Game room was great for evening entertainment, with a large flat screen and nice pool table or shuffleboard. Great location close to Hot Springs activities. Highly recommend this wonderful place to anyone wanting a great, comfortable getaway with fantastic views and amenities! !